The purpose of this edition, like that of any scientific-practical journal is information: informing medical doctors about the new methods of diagnostics, treatment and prophylaxis, achievements of science and practice, sharing experience, introduction of new effective methods of combating diseases of hepatobiliary zone, etc. Hepatology as a science studying diseases of the liver and biliary tracts in the object of studies of numerous scientific disciplines, first of all gastroenterology and infectology. The widespread acute and chronic viral hepatitis that produces a dramatic epidemic process and cause cirrhosis of the liver and hepatocellular carcinoma turns hepatology into an object if interest for epidemiologists, virologists, immunologists, oncologists and range of other specialists. Combination of their efforts is an exceptionally important task, regular familiarization with successes and achievements in various aspects of hepatology. However, the level of this work in Ukraine does not modern requirements both, from the standpoint of intensity of morbidity, and from the standpoint of achievments of medical science. It is sufficient to recall that in many countries of the world the problem has risen of a serious reduction of the level of morbidity and even elimination of hepatitis B, wide-scale investigations are underway in the studies of genetic heterogeneity of the pathogen, effective methods of antiviral therapy against hepatitis C are used on the mass scale, orthotopical transplantation of the liver has found a widespread application, etc. 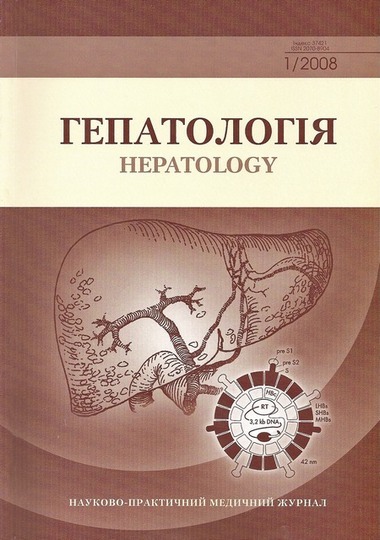 Yet we hope that the journal “Hepatology” will stimulate the progress in combating diseases of the hepatobiliary zone.